Irvine, Calif. (April 7, 2014) – There were no problems in Houston on Saturday night for Monster Energy Kawasaki’s Ryan Villopoto as the three-time defending Monster Energy Supercross champion rocketed out to the holeshot at NRG Stadium and never looked back to earn his fourth win of the season. In the 250SX class, the Western Region riders returned to action and despite injuring his shoulder during the heat race, Monster Energy/Pro Circuit/Kawasaki’s Dean Wilson rode 15 strong laps to finish second. His teammate Justin Hill looked strong early but a couple of crashes in the treacherous whoops section saw him finish ninth. Villopoto entered the Houston round looking to regain some championship momentum but after a crash in his heat race, which sent him to the semi, the three-time supercross champ would have to dig deep. A thrilling last corner pass for the win in the semi to set up the rest of the night as Villopoto jumped out of the gate with a strong start, collected the holeshot and led wire-to-wire to get his fourth win of the season. Wilson had strong start to his heat race as he took the early lead, but a mistake in the whoops sent him to the dirt where he injured his right shoulder. The Scottish rider got up to finish fifth in the heat, and a visit to the medical unit, along with some quick therapy allowed Wilson to line up for the gate in the main event. In the main, he got a good start and quickly moved into second place. As the laps continued to click off, Wilson slowly made gains on the leader and after some close racing on the final lap, he was able to come home in the runner-up spot. With his win in Houston, Villopoto took another step closer to claiming his fourth straight Monster Energy Supercross title. RV gained 10 points on his nearest competitor and he now holds a 45-point advantage with just three races remaining. The dirt in Houston held up great in the indoor stadium but the long whoop section in the track design seemed to catch nearly every rider out. All three Kawasaki riders fell victim to the whoops at some point during the night but all three were also able to handle them better than most to score top finishes. Next week marks the return to the Pacific Northwest, home of both Villopoto and Hill. 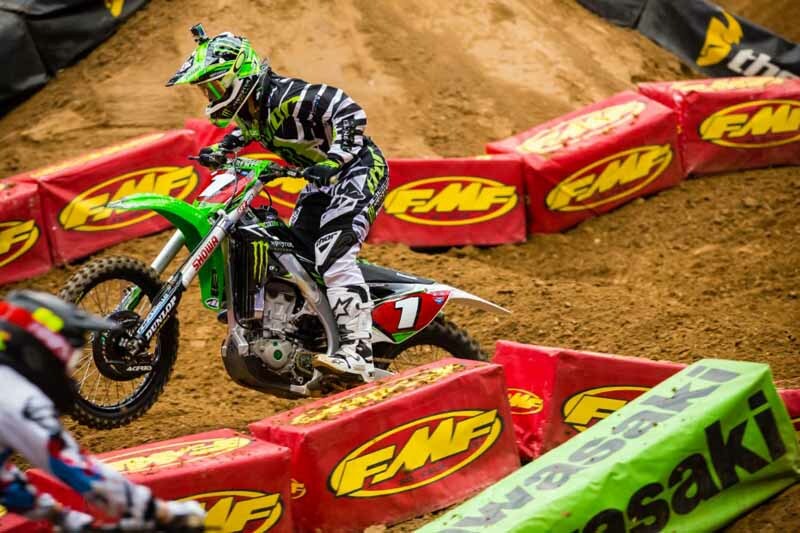 Both riders will be looking to take home a victory on their home soil as Monster Energy Supercross heads to Qwest Field in Seattle.